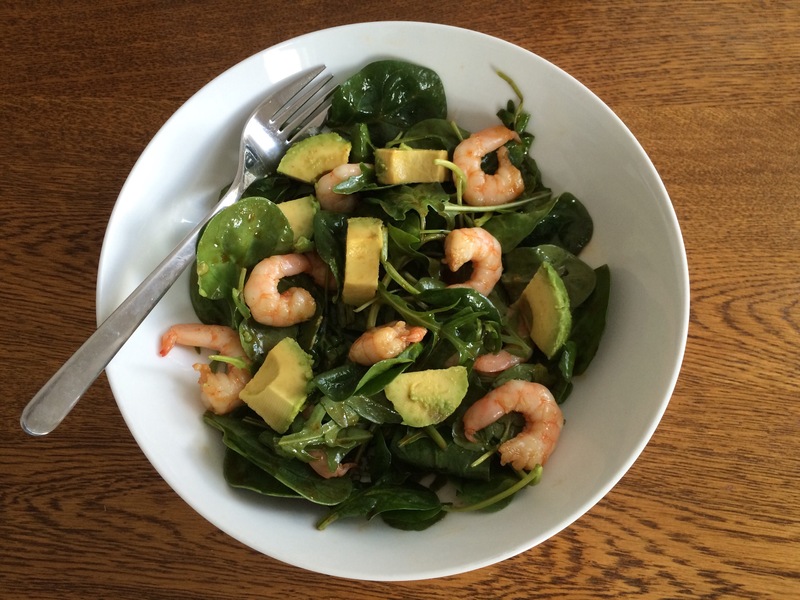 This is a delicious salad of juicy king prawns and creamy, soft avocado in a slightly spicy yet sweet Asian-inspired dressing on a bed of mixed leaves. Spring has sprung. As we feel rejuvenated by the sunnier mornings and longer evenings, and we start to think about the approaching wedding and holiday season, the lighter option of salad is once more appealing. But this ain’t any old boring salad. This lunchtime dish is an absolute treat. The dressing is made up of honey, sriracha chilli, soy sauce, lime juice and sesame oil, bringing together a mixture of exceptional sweet, spicy and salty flavours. It really packs a punch. I hate to be shellfish to all the other shellfish, but prawns are the king of crustaceans for me. They’re fairly firm in texture and have a subtle fishy flavour which is so versatile. They go well in soups, salads, curries, noodle dishes, pasta, dumplings, batter, on a barbecue, you name it. And let’s not forget the amazing avocado. It’s not the most Instagrammed food going by luck. This creamy green dome of goodness is highly nutritious, providing you with iron, Vitamin E and potassium. Pour the dressing ingredients to a large bowl and mix together with a metal spoon to form a smooth paste. Mix in the prawns and salad leaves until they’re well-covered by the dressing. Slice the avocado in half. Lift out the stone by scooping underneath it with a teaspoon and then scoop out each half. Cut into thick strips and then halve the strips into chunky cubes. Tip the prawns and salad mixture into a pasta bowl or plate and scatter over the avocado. 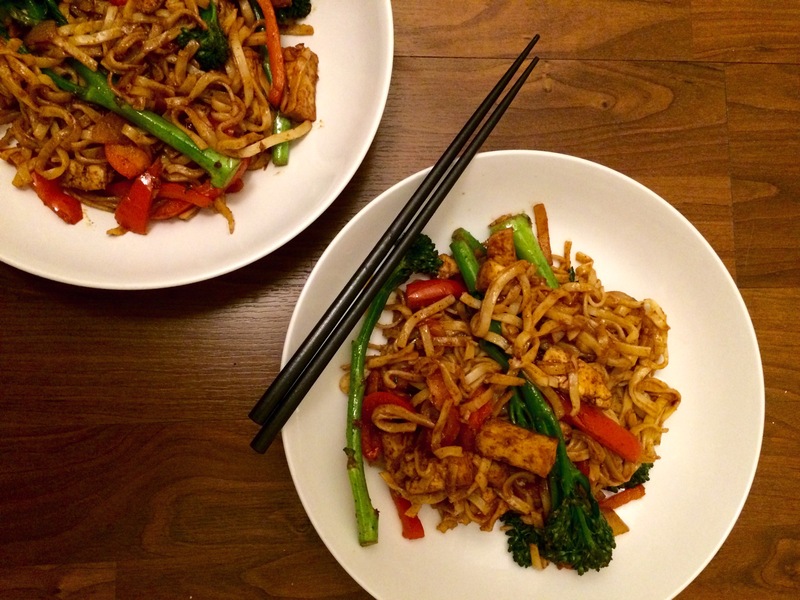 If you fancy having this for dinner, add two nests of wholemeal noodles to the mix for a more filling meal. I know what you’re thinking. Seaweed? That slimy, dull green algae we’re so used to seeing washed up along the British coastline? Yes. Move over kale, seaweed is the new superfood. Seaweed is in fact a highly nutritious and versatile ingredient. Used widely in Korean and Japanese cooking, it’s packed full of minerals like iodine, which is great for the thyroid function and helps to strengthen the immune system. It contains more vitamin C than an orange, plus it’s high in protein. Seaweed can be used in a variety of dishes, including stock, soup, salad, and, of course, sushi. Its neutral, earthy taste pairs well with flavourful dressings and sauces, and it will leave you feeling full. You can find the dried stuff in some big supermarkets, as well as oriental supermarkets and online. 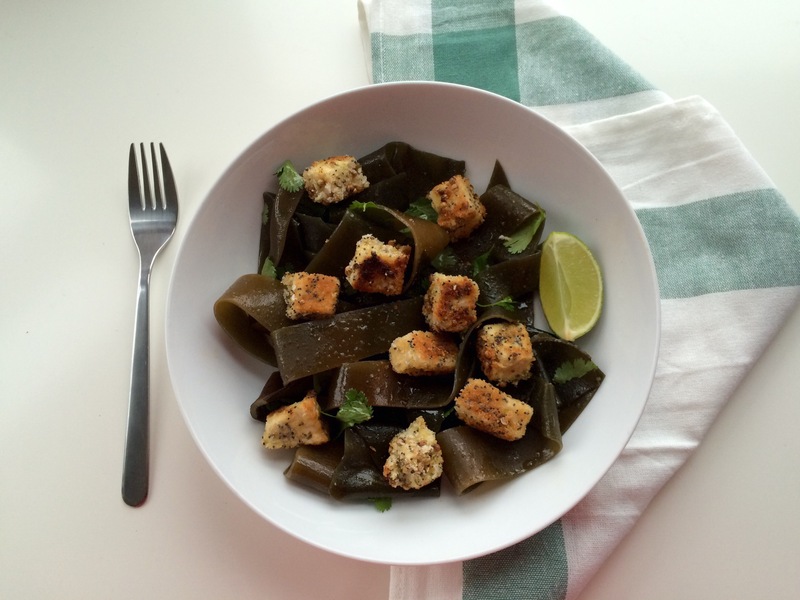 Try making this adaptation of Yotam Ottolenghi’s crusted tofu with seaweed and lime. The seaweed soaks up the chilli dressing, contrasting wonderfully with the punchy coriander seeds and lime in the tofu coating. The seaweed ribbons have a thicker texture than you’d expect, similar to lasagne sheets, though with a fresher taste and more bite. to the boil and then simmer for 10 minutes. 2. Whisk together all of the dressing ingredients except the groundnut oil. Gradually add the groundnut oil, whisking as you go. breadcrumbs, lime zest and sesame seeds, a pinch of salt and stir in together. tofu in the flour, followed by the egg and lastly the breadcrumb mix. 4. Drain the seaweed, and cut into 2-3cm wide ribbons. the tofu for a few minutes on each side, until golden brown. This showstopper of a tart is the perfect main player for a vegetarian Sunday lunch. The colourful spiral slithers of courgette, aubergine and carrot arranged on a butternut squash puree and shortcrust pastry base, make for an impressive dinner party centrepiece. As we start to see more frequent bursts of sunshine and there’s a chance of leaving work while it’s still light, the hopeful season of spring is surely on the horizon. This tart epitomises the season of new beginnings, delightful daffodils and blooming blossom with its colourful flower-like shape. But what does it taste like? Well, the pastry is light and crisp, the butternut squash and sage puree adds a sweet and earthy base and the vegetable spirals bring a trio of textures with a hint of chilli. Be warned, this tart does take some time to prepare. This is definitely a dish to make on the weekend, or when you have a couple of hours spare to get creative in the kitchen. Also, the vegetable spirals can be achieved with a vegetable peeler, but speaking from experience, I would advise investing in a mandoline. This recipe is adapted from Homemade. Their version is vegan, but I opted for traditional cooking spread over soya spread as I was after a creamier pastry. I found that I had loads of leftover vegetables, so I’ve suggested a smaller quantity below. 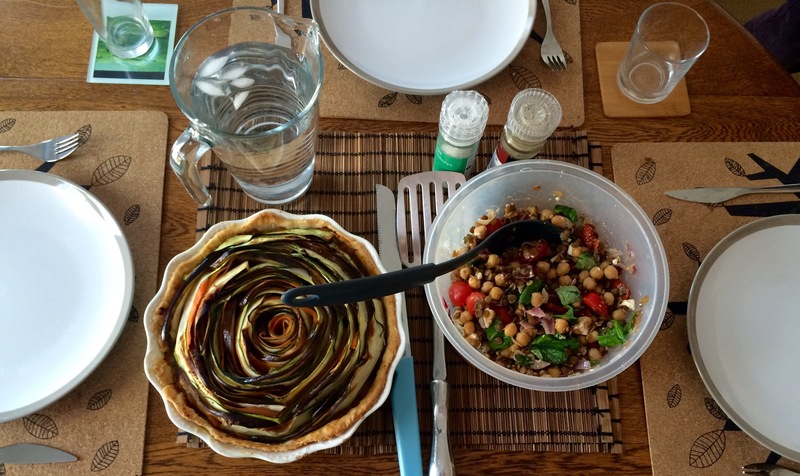 I served this with a feta and lentil salad to satisfy my cheese needs, but you could easily add some goats’ cheese, feta or mozzarella to the tart itself if you fancy. Half-fill a mug with cold water and put it in the freezer. Sift the flour into a large bowl with a pinch of salt. Cut the cooking spread into cubes and add to the bowl. Rub the spread in with your fingertips, until it reaches a breadcrumb consistency. Remove the water from the freezer and add 3-4 tbsp, until the dough is moist enough to bring together with your hands. Form it into a ball, adding a bit more water if needed, wrap in clingfilm and place in the fridge for 30 minutes. Put the oven on to gas mark 6, and generously grease a large tart dish. Meanwhile, make the butternut puree. Finely dice the onion and then chop the butternut squash into small cubes. Put a large frying pan on a medium heat and pour in 1 tbsp of olive oil. Add the onion and cook for 5 minutes, or until the onion begins to soften. Drop in the garlic, cook for a further minute, and then add the butternut squash and sage. Add 2-3 tbsp of cold water and bring to the boil. Stir, cover and cook for 10-12 minutes, or until the squash cubes have softened. While that’s cooking, prep the vegetable spirals. Chop the ends off the veggies and use a peeler or a mandoline to slice them into thin ribbons. Tip: if you’re using a peeler, I’d advise slicing the aubergine thinly with a knife instead, as the flesh is difficult to slice with a peeler. Pop your spirals into a large bowl as you go, and then sprinkle over the chilli flakes and pour in the agave syrup so it’s evenly dispersed. Mix the syrup and chilli in with the vegetables using a metal spoon. When the squash is cooked, take it off the heat and mash it to a smooth paste. Remove the pastry dough from the fridge. Lightly flour a clean surface and roll the dough out till it’s roughly 5mm thick. Carefully lift it up and lay it in the tart dish, trimming the edges with a knife. Cover with foil and pour in baking beans or rice to weigh the foil down. Pop in the oven for 10 minutes, then take out and remove the beans/rice and cook for a further 5 minutes. Remove from the oven and reduce the oven heat to gas mark 4. Next, add the filling. Remove the foil from the tart and spread the butternut puree over the bottom with a metal spoon. Now comes the artistic bit. 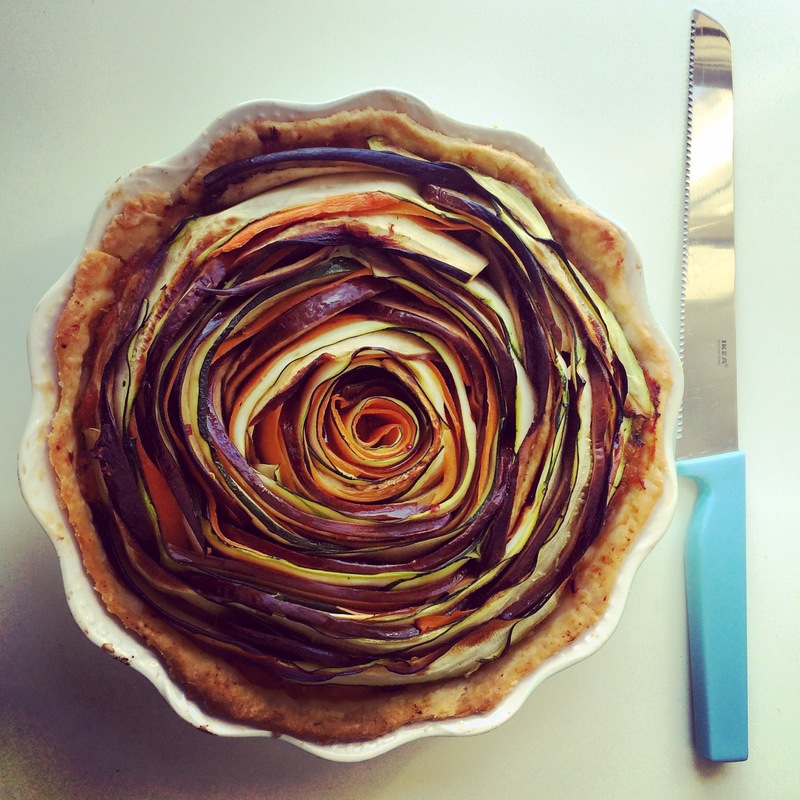 Take a slice of carrot, aubergine and courgette and curl them together into a tight spiral. Place the spiral in the middle of the tart and then gradually grow the spiral by adding alternating vegetable ribbons until you reach the outside of the dish. Drizzle over the remaining tbsp of olive oil and place in the oven for 45-50 minutes, or until the vegetable ribbons have softened. Leave to cool for a few minutes, then serve with a salad. Sometimes all that will suffice is a big old bowl of comforting creamy pasta. Look no further than to this magnificent meatfree medley of green veggies and spaghetti in a creamy cheese and garlic sauce. 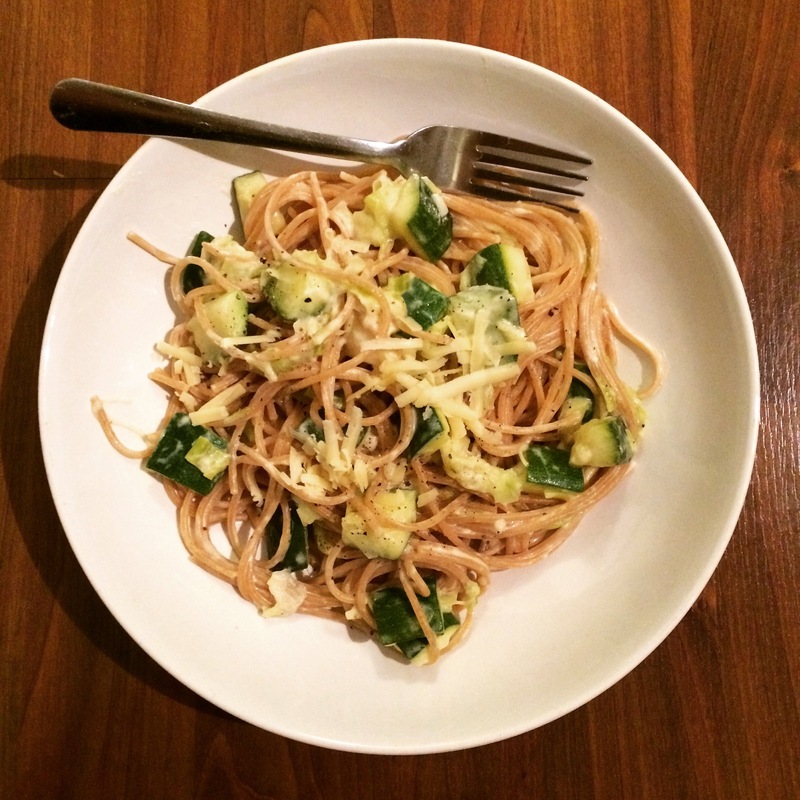 This dish is creamy, cheesy and flavoursome, yet has plenty of goodness from leek, courgette and wholewheat spaghetti. And you can have it on the table in 20 minutes. Chop off the woody ends of the leek and slice down the middle, so you can see the middle layers, but not all the way through to the other side. Open up the middle layers of the leek and run under a cold tap to clean off any grit. Slice into thin strips. Wash the courgette and cut in half lengthways, then cut horizontally into small pieces, around 2-3cm thick. Meanwhile, half-fill a medium saucepan with water and bring to the boil. When the butter has melted, add the leek and courgette and fry until soft, around 5-8 minutes. When the water is boiling, lower in the spaghetti, making sure it’s all covered by the water. Cook to pack instructions. When the vegetables are soft, add in the garlic and fry for a further 2 minutes, stirring frequently. Add the creme fraiche, lemon juice and milk and carefully pour a little bit of the water from the pasta pan into the frying pan. Stir in together and then add half of the cheese. You should have a fairly thick creamy sauce. Add more creme fraiche if needed. Season well and lower the heat. When the pasta has cooked, drain into a colander and tip into the frying pan. Mix the spaghetti in thoroughly with the sauce, and add the rest of the cheese. Add more salt and pepper if needed. Serve in large pasta bowls with a sprinkling of grated cheese if you fancy. One of the things I missed most about living in Clapton, Hackney, was the brilliant sourdough pizza place that was a five minute walk away. But thankfully my prayers have been answered as Sodo pizza has opened up a branch in my neighbourhood, Walthamstow. And it’s bigger and better than the Clapton cafe. I went in a few Friday evenings ago. The place was a little hard to find as it’s down a discreet side street and they’re yet to get proper signage at the front. But my empty stomach helped me find my way there and when I arrived, the place was buzzing; trendy couples and groups were waiting to be seated, and after a very short wait we were shown to our table. The restaurant is based in an old warehouse building, with exposed brick walls and industrial-style wooden tables with red leather seat covers. You can see the chefs cooking away as you enter, the staff are friendly and unpretentious and the atmosphere is great. The E17 branch has only been open since January, and they’d yet to get their drinks menus printed when I went, so we had to order from the waiter without knowing the price. This reminded me of central London pizza place, Homeslice’s service model, which I dislike. However I think this is only a temporary measure for Sodo while they get properly up and running. So I’ll let them off. They serve loads of local beers including Beavertown Brewery in Tottenham and Redchurch in Hackney. The menu is the same as Clapton.We ordered burrata and garlic sourdough to start. The burrata was just as delicious as ever; a huge silky slab of buffalo mozzarella stuffed with cream and served with fresh basil. 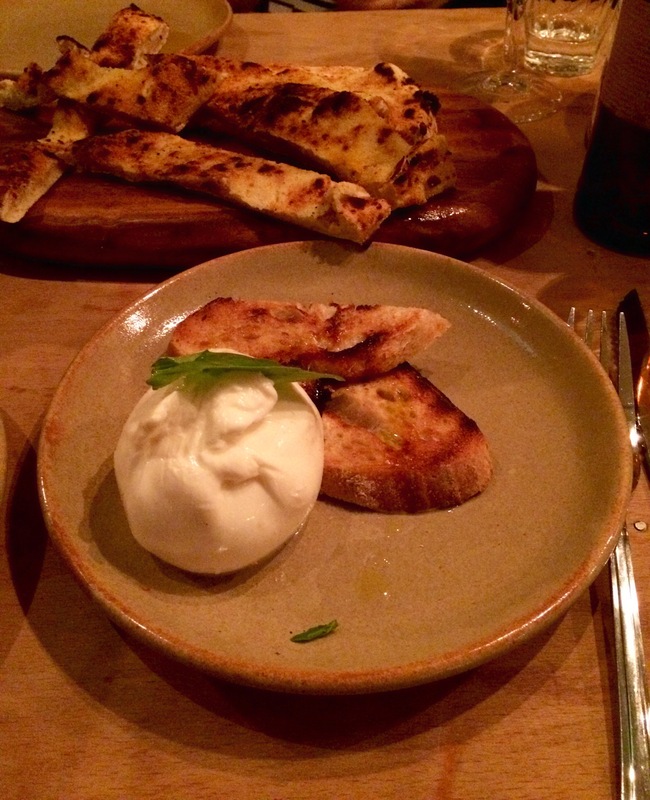 The garlic bread was a little on the dry side, but was a good accompaniment to the burrata. We didn’t really need starters, as the pizzas are more than enough on their own. 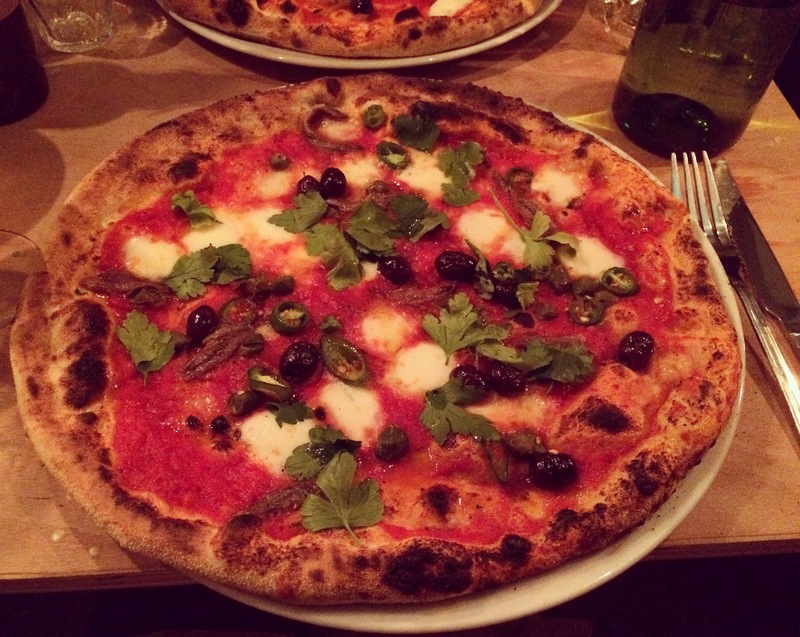 For main I had the Jon Bon Chovy: a margherita sourdough base, anchovies, black olive, capers, parsley and chilli. I can’t fault their pizzas; they’re delicious. Unfortunately I had no room left for dessert. But if I did, I would have gone in for their tiramisu; it’s completely yummy. Overall, the waiting staff were attentive and friendly, the food was decent and the prices are affordable. If you’re in or around Walthamstow, I highly recommend making your way to Sodo. For quality, price and atmosphere, it knocks the socks off Pizza Express round the corner. I’m already planning what I’m going to have on my next visit. Check them out for yourself. This light and nutritious noodle dish is bursting with aromatic flavours of lime, garlic and Asian spices. Crunchy tenderstem broccoli and firm tofu add great texture to silky ribbon noodles. I love noodles. If I had to eat just noodles (for lunch and dinner, I like a conventional breakfast) for the rest of my life, I wouldn’t mind. I love a strong taste of garlic. I’d say about 80% of the food I cook contains garlic. Where would we be without it? In an incomprehensible, flavourless world, that’s where. Pasta, noodles, curries, bread and dressings would all be bland without it. I love most green veggies. Especially tenderstem broccoli. It’s fancier than the frozen or fresh regular stuff, so it’s a tasty and healthy treat to have now and again. You can taste the difference (without meaning to coin a well-known supermarket’s branding); it’s much sweeter and crunchier. Of course if you don’t have any in the fridge, you could use green beans, sugar snap peas, mangetout, or ‘normal’ broccoli of course. These three elements combined with tarte lime, salty soy and flavourful curry powder soaked up by firm baked tofu, make for a satisfying supper inspired by the rich flavours of Canton. This recipe is a little more complicated than a standard one pot dish as the vegetables, tofu and noodles need cooking separately, but it means each ingredient soaks up all of the lovely flavours, so it’s worth doing this way. Firstly you need to extract the moisture from the tofu. Place the tofu on a plate and balance something heavy on top. I used a chopping board with two heavy pans balanced on top. Leave the tofu to drain for as long as you can – 15 minutes should be fine. While the tofu is draining, put the oven on to gas mark 7. When the tofu is ready, remove the heavy objects from it and tip the excess water on the plate into the sink. Chop the tofu into rectangles, around 3-4cm long. Place the tofu on a baking sheet lined with baking parchment and put in the oven for 20-25 minutes, or until golden brown, turning half way through. Meanwhile, finely slice the pepper and onion. Put a large non-stick pan on a medium heat and pour in 1 tbsp of sesame oil. Add the onion and pepper and fry for 4-5 minutes, or until the onion turns translucent, stirring frequently. Prepare the sauce by adding the remaining soy sauce, crushed garlic, lime juice and brown sugar to a jug. Whisk together. Remove the tofu from the oven when it’s ready and turn the oven off. Carefully peel the tofu from the baking paper and add to the pan. Pour over half of the sauce you’ve just prepared, ensuring it coats the tofu. Cook for a few minutes, until it’s well marinated. Remove from the pan. Add the remaining ½ teaspoon of sesame oil to the pan and add the noodles along with the remaining 2 teaspoons of curry powder. Stir the powder in with the noodles. Cook for a couple of minutes. Return the vegetables and tofu to the pan and stir well. Pour over the remaining sauce and cook for another couple of minutes. Serve in large bowls with a side of sweet chilli sauce and chopsticks. This hearty vegan rice dish is as flavourful as it is vibrant. Soft cubes of aubergine soak up the wonderful aromas of garlic, paprika and chilli, while the green beans and pepper add a satisfying crunch. Turn the heat up on your taste buds with this veggie variation of a Louisiana classic. It’s super healthy, simple to make and it’ll be on the dinner table in half an hour. Perfect for a mid-week meal. Put a large pan on a medium heat and pour in the oil. When the oil has heated up, tip in the onion and pepper and fry for 5 minutes, stirring frequently. Take the pan off the heat while you add the chilli, paprika, garlic and thyme. Combine the spices with the onion and pepper using a wooden spoon and return to the heat. Stir in the aubergine, ensuring the spice mixture covers it all. Then add the tomato puree, chopped tomatoes and rice. Cook for 3-5 minutes, stirring to combine everything. Add the vegetable stock and bring to the boil. Pour the green beans in, season the mixture, stir well, cover and simmer for 20 minutes. Stir 2-3 times while it’s simmering to check the rice isn’t sticking to the pan. After 20 minutes, try a bit of the jambalaya to check the rice is cooked. Season well and leave to stand for a few minutes. Serve in bowls with fresh green salad leaves. 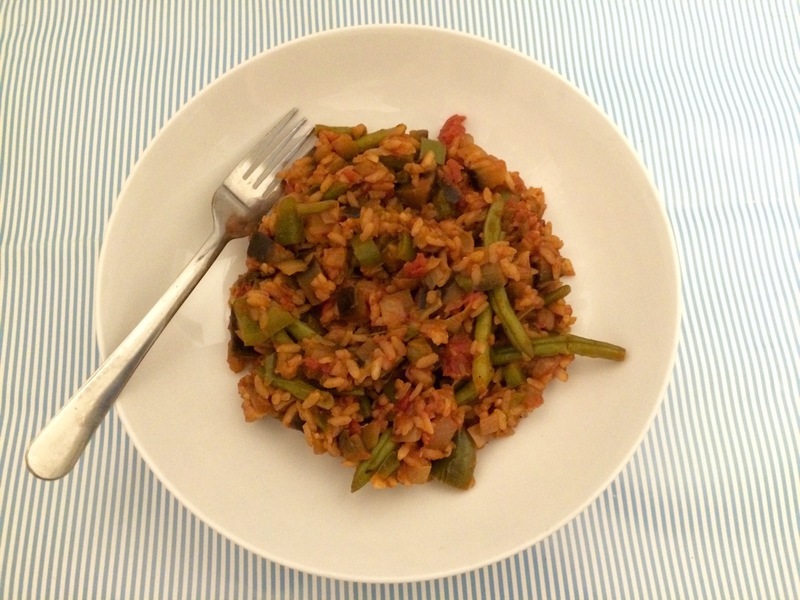 This recipe was inspired by Leon’s Aubergine Jambalaya.